This past week the Economist published a piece entitled Primates On Facebook that described some research done by the Facebook Data Team. Since there have been a number of questions throughout the monkeysphere, we thought we would take the opportunity to describe our approach, the data, and our analysis. We were asked a simple question: is Facebook increasing the size of people’s personal networks? This is a particularly difficult question to answer, so as a first attempt we looked into the types of relationships people do maintain, and the relative size of these groups. The image above presents a high-level overview of our findings: while the average Facebook user communicates with a small subset of their entire friend network, they maintain relationships with a group two times the size of this core. This not only affects each user, but also has systemic effects that may explain why things spread so quickly on Facebook. Before discussing the data, let us first set the context. 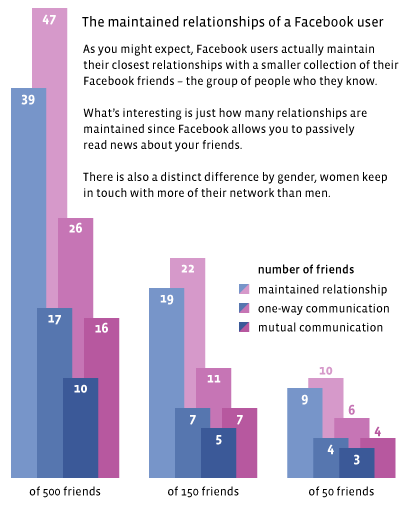 Many people are asking questions about the number of friends they have on Facebook. Do I have enough? Do I have too many? What may be tripping people up here is the language: while the people youâ€™re connected to on Facebook are called your â€œfriends,â€ theyâ€™re more likely people you have met at some point in your life. Social network researchers have been trying to measure this number for decades, and come across a number of clever techniques. If youâ€™ve read the Tipping Point, you may remember a study Gladwell described where people were asked to identify whether or not they knew people with names from a long list culled from a phone book. Based on the probability of knowing someone with a given name and the number of people with this name that a person knows, we can estimate the number of people a given subject has met. Killworth, et al. found using this technique and others that the number of people a person will know in their lifetime ranges somewhere between 300 and 3000 ((Killworth, P., Johnsen, E., Russell, H. B., Shelley, G. A., and McCarty, C. Estimating the size of personal networks. Social Networks 12 (1990), 289â€“312.)). On Facebook, the average number of friends that a person has is currently 120 ((Facebook Statistics)). Given that Facebook has only been around for 5 years, that not everyone uses it, and that the not every acquaintance has found each other, this number seems reasonable for an average user. As a subset of the people you know, there are some individuals with whom you communicate on an ongoing basis. The number of individuals that represent a person’s core support network has been found to be much, much smaller than their entire network. Peter Marsden found the number of people with whom individuals “can discuss important matters” numbers only 3 for Americans ((Marsden, P. Core discussion networks of americans. American Sociological Review 52, 1 (1987), 122â€“131.)). In a subsequent survey, researchers found that this number has dropped slightly over the past 10 years ((Mcpherson, Miller, Smith-Lovin, Lynn, Brashears, and Matthew, E. Social isolation in america: Changes in core discussion networks over two decades. American Sociological Review 71, 3 (June 2006), 353â€“375. )), causing some alarm in the press, but without sufficient explanation ((While this work is well cited, there is support that the methodology underestimates the core network, e.g. Bearman, P., and Parigi, P. Cloning Headless Frogs and Other Important Matters: Conversation Topics and Network Structure. Social Forces 83 (2004), 535.)). How many people an individual communicates with probably exists somewhere between their total network size and their support network. Some research by Gueorgi Kossinets and Duncan Watts observing all email communication at a university shows that the number of ongoing contacts hovers somewhere between 10 and 20 over a 30 day period ((Kossinets, G., and Watts, D. J. Empirical analysis of an evolving social network. Science 311, 5757 (January 2006), 88â€“90.)). Facebook and other social media allow for a type of communication that is somewhat less taxing than direct communication. Technologies like News Feed and RSS readers allow people to consume content from their friends and stay in touch with the content that is being shared. This consumption is still a form of relationship management as it feeds back into other forms of communication in the future. For instance, a high school friend uploads a photo of her new puppy and this photo appears in your News Feed. You click on the photo, browse through a host of other photos and discover that she has also gotten engaged, which may lead you to reach out to her. This type of communication is the core of the Facebook experience, and given the question posed by the Economist, we wondered what effect this sort of relationship maintenance had on the breadth of people’s networks. All Friends: the largest representation of a person’s network is the set of all people they have verified as friends. Reciprocal Communication: as a measure of a sort of core network, we counted the number of people with whom a person had had reciprocal communications, or an active exchange of information between two parties. One-way Communication: the total set of people with whom a person has communicated. Maintained Relationships: to measure engagement, we took the set of people for whom a user had clicked on a News Feed story or visited their profile more than twice. 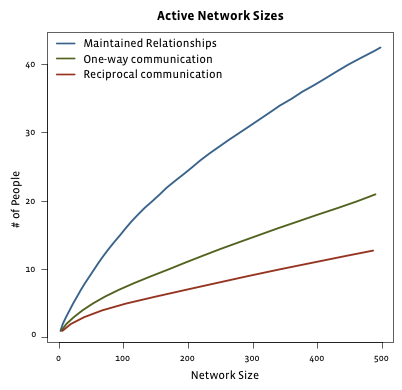 For each users we calculated the size of their reciprocal network, one-way network and network of maintained relationships, and plotted this as a function of the number of friends a user has. As Andreas mentions in his blog post about the article, the visualization (shown below) did not make it into the article, but presents a pretty clear picture of the relationship between these types of communication. What effect does a 2x increase in connectivity mean for a network? The easiest way to observe this is to look at one person’s personal network. The image below shows the personal network for one of my coworkers. The first diagram shows his entire network, namely all of his friends, and all of the relationships between his friends. 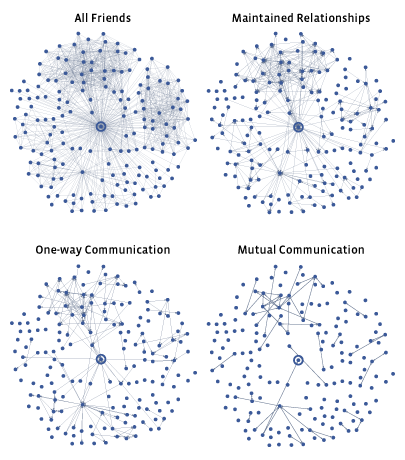 It is clear that the cluster on the top is the highly connected set of Facebook coworkers, and the cluster on the right is another group of friends. The cell on the bottom right shows only those relationships that have reciprocal communication. Many of the individuals in his network are completely disconnected or out of touch with each other. Moving to the bottom left cell, we see the slightly more connected network containing one-way communication. This includes every person who wrote a comment, sent a message or wrote a wall post to one of my coworker’s other friends. The cell on the top-right shows the passive network, including all those people who were keeping up with their friends. While some of his friends are still disconnected, a very large percentage are now reachable through some set of observations. The stark contrast between reciprocal and passive networks shows the effect of technologies such as News Feed. If these people were required to talk on the phone to each other, we might see something like the reciprocal network, where everyone is connected to a small number of individuals. Moving to an environment where everyone is passively engaged with each other, some event, such as a new baby or engagement can propagate very quickly through this highly connected network. While these data are not a controlled experiment, and do not directly relate to the theories described above, they do show a directional trend in the way people manage relationships on a social network today. We hope to continue this line of research with the eventual hope of making relationships that much easier to manage. This post represents the work of data scientists Lee Byron, Tom Lento, Cameron Marlow, Itamar Rosenn. Special thanks to Alex Smith for letting us use him as an example. For more insights like this, make sure to become a fan of the Facebook Data Team.